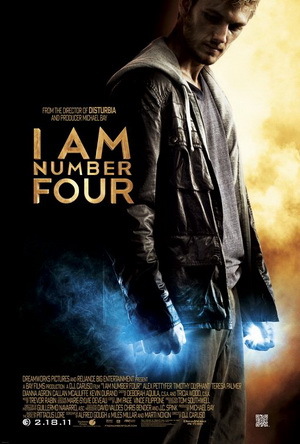 I am Number Four is a YA Science fiction novel that was published in August of 2010. It tells the tale of John Smith, Number Four, who is always on the run to protect his life. there are nine of them (who, you ask? I don’t want to say, it will spoil part of the story! ), and they must be killed in order. The first three are dead, and he’s next. Those of us here at Lytherus who have read this sensational, high-tension book think it is one of the best of the year. Wonderfully written, we couldn’t put it down. So imagine our surprise and delight when we saw that a movie version was in the works, set to be out on February 18th, 2011. I thought that seemed a bit soon after the release of the book, and in fact, the manuscript was taken to DreamWorks in June 2009 to see about buying it for production, over a year before it was even on the shelves. The movie stars such actors as Alex Pettyfer (Alex Rider in Stormbreaker), Timothy Olyphant (Sheriff Seth Bullock in Deadwood), and Dianna agron (best known for her role as Quinn on Glee). Even Steven Spielberg had a hand in developing the characters. Any book-turned-movie runs the risk of destroying the original story that is well-loved, and so we are tentatively excited about what the movie will be like. Hopefully it lives up to the awesomeness of the book, making it a must-see film!